Samurai Jack Season 5 finale! This final episode had me in tears! people can complain about it being a cliche all they want but this is probably the most emotional episode ever in cartoon network and adult swim history! Jack finally faced Aku face-to-face after years of his training to defeat the evil god-like evil . After a brief conflict ending with his love being caught under Aku control he was caught by the monster himself and even his magical sword, Aku had then broadcasted to the entire world about his story and as those who viewed it was including to all those Jack has saved who he called friends and took his time deciding how to rid Jack infront of the whole world, but Aku had made a grave mistake with his plan. Aku pit his daughter Ashi against the hero, controlling her as she fought the samurai whom she loved. However, She had broken out of her father's control when Jack confessed his love for her. In order to defeat the demon, Ashi had used her demonic powers that was inherited from Aku to travel back in time with Jack. The duo lovers went back to the past right at the moment Aku sent Jack to the future. It was there Jack was able to cut down and kill Aku, ridding the entire world of his evil and sick tyranny and rewriting the world’s timeline in a one shot. However, the death did have one unseen side effect. With Aku having never existed in the future and now jacks current past, Ashi was also wiped from the timeline as she never had the chance to be born. 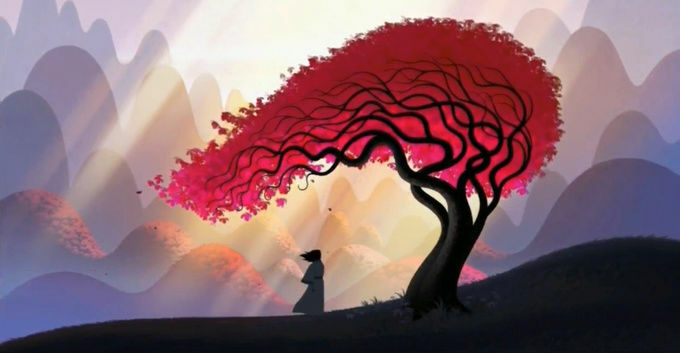 The heroine had fainted as she walked down the aisle to marry Jack, and she told him that because he rid Aku from both the past and future timeline she too ceased and with this she had fated away from existence in her husbands arms, and leaving the samurai alone as he later had reminisced about his journey and his fate to ride Aku while under a blooming cherry blossom tree with a ladybug showing a reflection of Jack and Ashi being soulmates. I have never been so emotional over a kids cartoon before but this episode had me grasping my heart for Jack and everything he has done and ended up still like this....he lost his love but again gained back his life......I will say there is ALOT and I mean ALOT of directions the creator can surely go on to.....a path of a warrior redemption? a path of finding a way to revive his love? MANY and MANY ideas could come if they ever considered doing more seasons for this beloved childhood television show.